PulpRev: What Do Otaku Readers Really Want? What Do Otaku Readers Really Want? The Japanese publishing industry is getting predictable. Every other week, there's a brand new series starring a Japanese high schooler who is mysteriously transported to a fantasy world. There he promptly gains overwhelming powers, the antagonism of the local Demon King, and the affections of a harem of cute, buxom, mature, demihuman and underage girls. Harem hijinks, massive explosions, and indecisive fumbling and awkward stuttering follows. And along with these come the inevitable light novel/manga/anime/movie/game/mobile adaptations. Exaggeration? Probably, but not by much. As JD Cowan notes in two separate blog posts, pandering to otaku makes easy money. 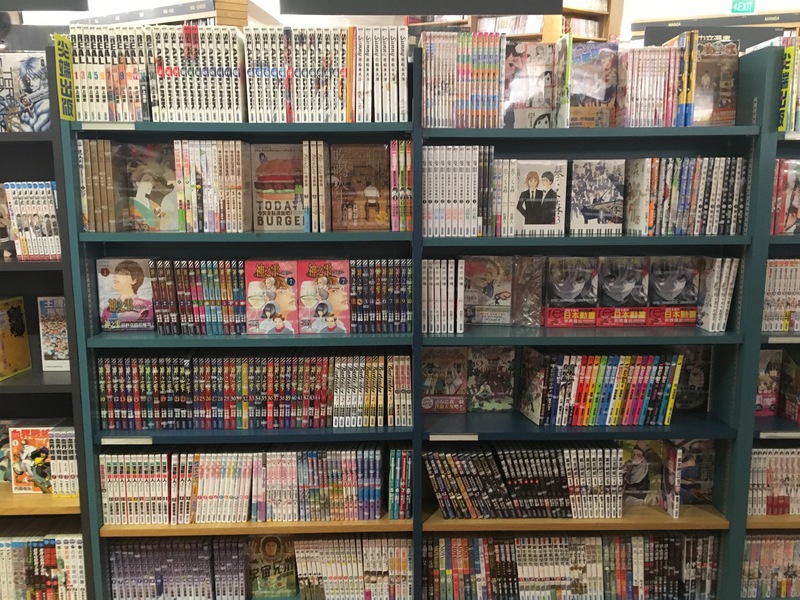 While he was writing about the context of anime, the Japanese publishing and anime industries tend to be tightly integrated. If a manga or light novel becomes a bestseller, an anime adapation will follow, and vice versa. A glance at the covers will tell you what the contents of many of these stories are about. Having read several of these manga, I can confirm that the covers are faithful representations of the contents. The deliberate positioning of these books at eye height, where customers can easily spot them, likewise indicate what the bookstore thinks will sell best. That said, while it's easy to dismiss all modern manga, anime and light novels as fanservice, a closer inspection will reveal more interesting tidbits. Among the titles I found were Nejimaki Seirei Senki - Tenkyou no Alderamin (Alderamin in the Sky), a military fantasy series; Fate/Strange Fake, a spin-off of a popular urban fantasy franchise; Ri:Zero kara Hajimeru Isekai Seikatsu (Re:Zero − Starting Life in Another World), a isekai fantasy story with death-triggered time travel as its main gimmick; All You Need is Kill, a military science fiction time travel story; and Golden Kamuy, a historical action thriller. None of these titles are fanservice titles, and yet they take pride of place in bookshelves. These are also the kind of stories that will be exported overseas. Otaku pandering may be a surefire formula for financial success in Japan. But in places without a significant otaku population (i.e. the rest of the world), works that rely on fanservice and otaku in-jokes aren't going to survive. The more risque ones might even be banned outright, formally or otherwise. Companies that specialise in importing, translating and distributing Japanese media need to select works that they believe will appeal to their audiences. Bookstores, in turn, have to make careful stocking selections to ensure maximum returns. As bookstores shutter their doors and online marketplaces expand, stocking the right kind of books spell the difference between profit and closure for brick-and-mortar bookstores. Looking at translated media gives a good gauge of what distributors and bookstores believe to be the tastes of the local audience. It may not necessarily be totally representative of what the audience is looking for, but it provides insights into the state of the industry and the tastes of the market. With this in mind, I visited the Kinokuniya bookstore at Orchard Road on the 29th of December. My first stop was the manga section, with some of its offerings photographed below. These manga are shounen titles, aimed at males between the ages of 12 to 18. These are wildly-popular series: Attack on Titan, Your Lie in April, One-Punch Man. Other titles on offer include Blue Exorcist, Fairy Tale and Servant x Service. You might also find the odd seinen manga, which are works for males between 18 to 35, such as Ghost in the Shell, Vagabond and, if you are incredibly lucky, Berserk. Fanservice is not in demand in Singapore's bookstores. And the titles I've discovered are all hits in Japan--and in the West. This indicates that there is an aesthetic that transcends geographical and cultural borders. Not to mention media genres. 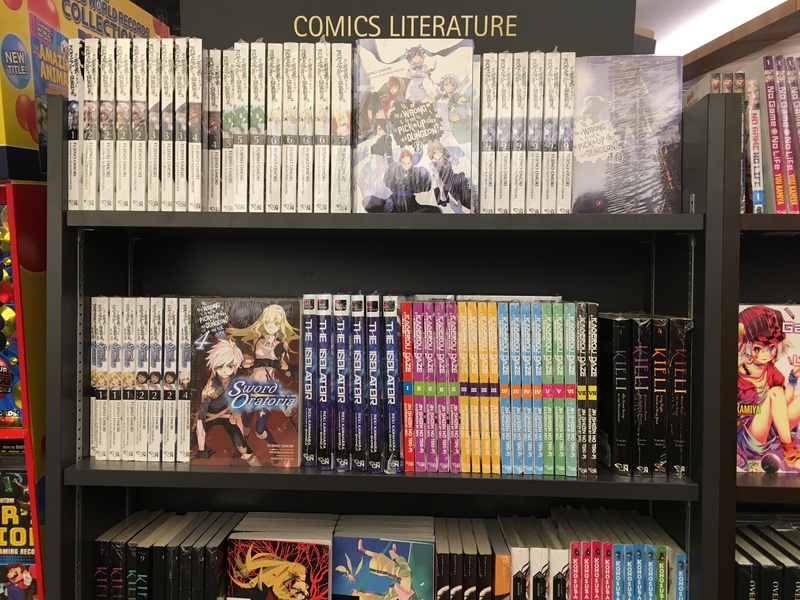 For a most mysterious reason, English-language light novels are shelved under 'Comics Literature'. Even franchises that began as light novels (Is It Wrong to Try to Pick Up Girls in A Dungeon?) or web novels (The Rising of the Shield Hero). Naming peculiarities aside, a quick glance at the shelves speaks volumes about local tastes. Once again, these titles are hits in Japan and the West, and most are not fanservice-heavy titles. The majority of them are shounen titles too. Indeed, I counted only three explicit seinen titles tucked away: Overlord, Re:Zero and the infamous Goblin Slayer. As you can see, the books are practically skeletal by Western standards. For instance, every chapter in Is It Wrong to Try to Pick Up Girls in A Dungeon? tends to run to about 20-25 pages, with plenty of white space, one-liners or three to four-line paragraphs, and minimal descriptions. This allows the bookstore to stock multiple copies of the same book, and indeed keep the entire series in inventory, without sacrificing much shelf space. It also allows the reader to quickly breeze through the book -- and drives demand for the sequel. The English-speaking demographic of Singapore seems to favour shounen titles filled with action, fantasy, adventure and a dash of harem hijinks. Seinen stories are a tough sell. Wandering over to the Chinese section, I noticed straightaway that the Chinese naming conventions tend to be in line with Japanese ones. Light novels are indeed called light novels, and manga is translated as manhua. 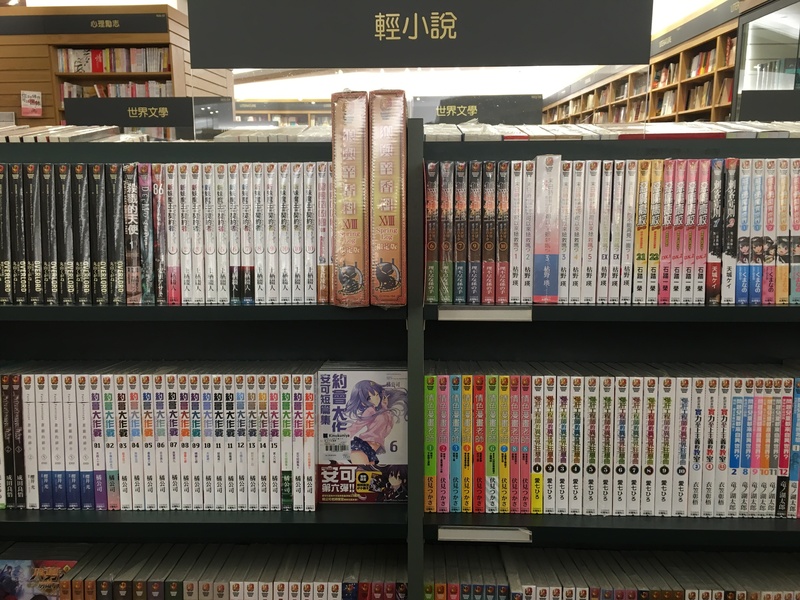 Unlike the English section, there is also a shelf reserved exclusively to web novels. 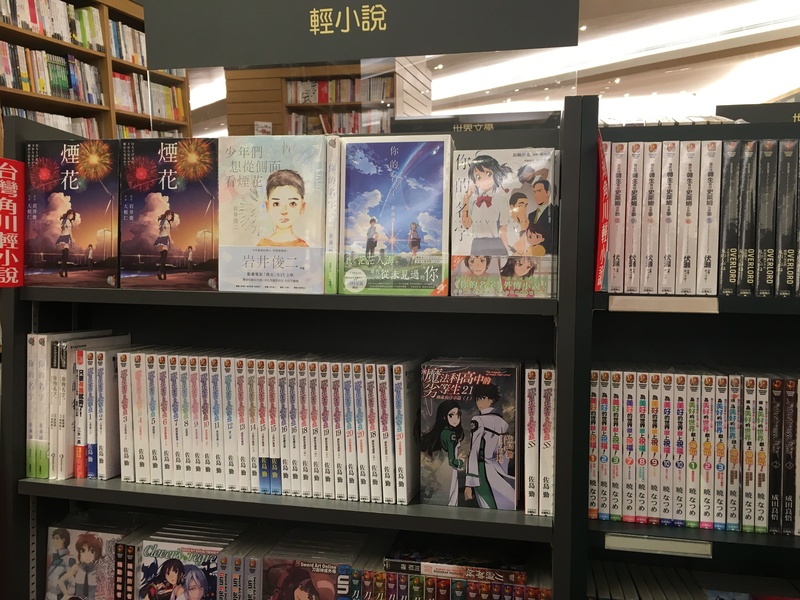 The Chinese manhua shelf shows a surprising diversity of works -- not the least because the Chinese language section has more shelf space for Japanese imports. There are oldies but goodies like Slam Dunk and Ranma 1/2, contemporary sci fi like Space Brothers, and the odd seinen title like Billy Bat. There are likely a number of original Chinese manhua mixed in the shelves too, but I'm not familiar enough with manhua to make a definitive pronouncement. And smack-dab in the middle is Cardcaptor Sakura. There doesn't seem to be a preference for genre, demographic or publishing date -- just a preference for proven bestsellers. The one thing we can say that the Chinese market probably loves is Gundam. The light novels section likewise follow a similar trend. With more shelving space comes an increased variety of selections. We have Chinese-translated versions of Japanese favourites like Your Name, Fireworks, Should We See it From the Side or Bottom?, and The Irregular at Magic High School. There are seinen titles like Overlord, Until Death Do Them Part and Re:Zero, and fanservice books like Ero-Manga Sensei and Only Sense Online. I also found classics like The Kindaichi Case Files and more obscure titles such as Alice Mare. 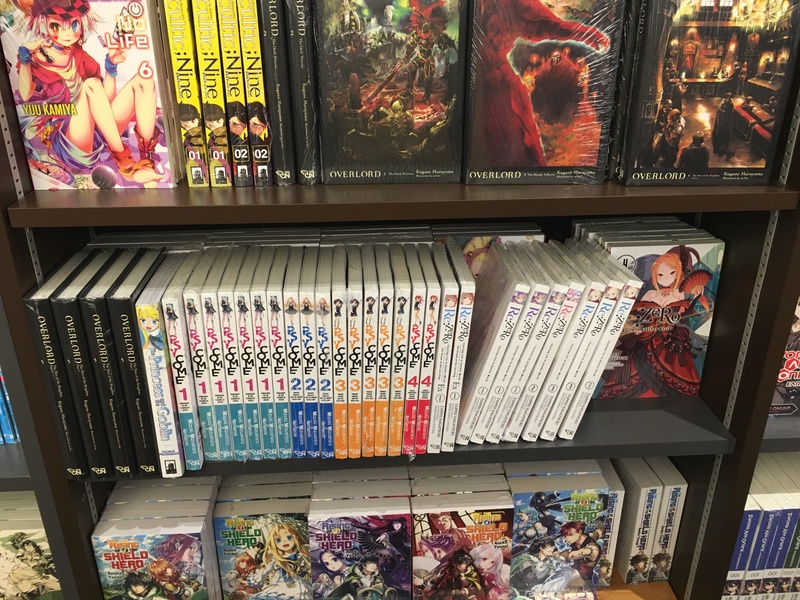 There's at least four times the shelf space dedicated to Chinese light novels than their English counterparts. 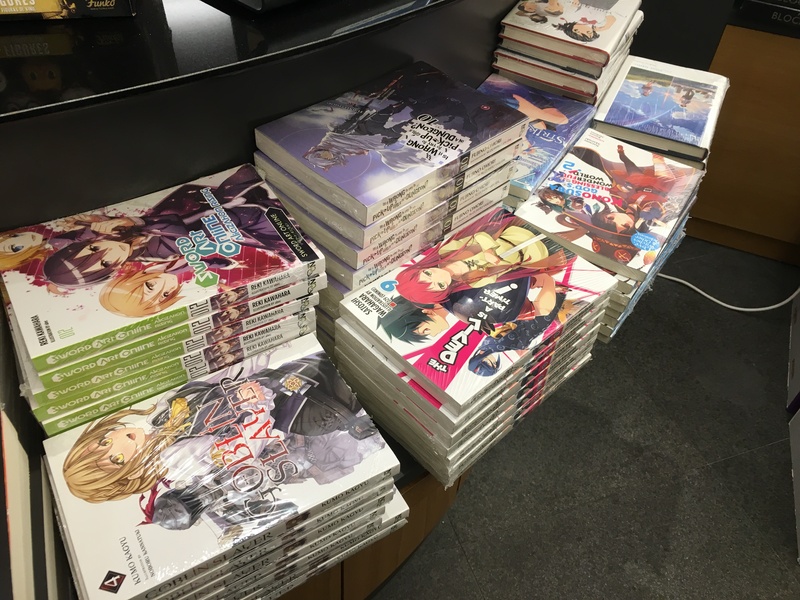 This is possibly indicative of increased demand for light novels among Chinese readers than English readers. Further, many Chinese language novels are published in the same short and thin style as Japanese light novels. The familiar formatting might make it easier for Japanese light novels to break into the Chinese market. The web novels section stands apart from the others. Virtually all the titles on sale are Chinese-language original works. With the odd doorstopper, many print web novels tend to either be as long as their light novel counterparts or perhaps a fraction longer. Chinese language web novels are also markedly similar to their Japanese counterparts, with brief, breezy writing, volume-spanning story arcs, and hundreds, if not thousands, of chapters. The number of shounen works vastly outnumber those of seinen stories. This shouldn't be surprising, since there are far more shounen stories out there. But there is also a distinct lackof shoujo and josei stories too -- stories targeted at girls and women. You'll have to work to find the latter two genres. Before the inevitable cries of sexism, I should point out that the shelves I've photographed comprised a tiny fraction of the total shelf space available in Kinokuniya. With so little space to work with, the bookstore needs to prioritise titles that will turn a profit. They will select for titles with universal appeal, which seems to be shounen works. For non-shounen stories to break out into the market, they'll have to find a way to differentiate themselves from the competition. The English-speaking market seems to prefer modern works, while the Chinese market has a mix of modern and classic works. 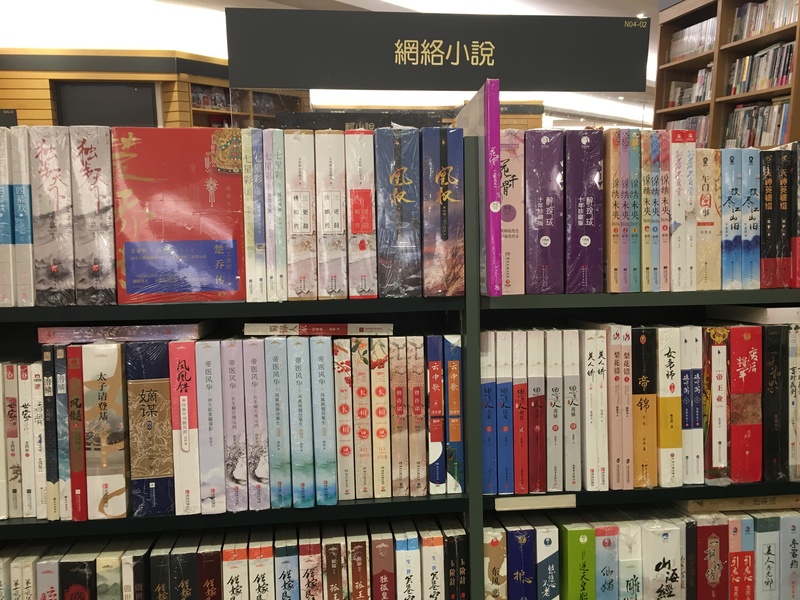 This could simply be due to the limited shelf space available for English-language books -- and perhaps an indication that Chinese translation may not be a commercial priority beyond well-known bestsellers. With that said, the length and size of the print stories are telling. Light novels and web novels all tend to be just the right size to hold in one hand. The same size as old pulp novels. However, the presence of thicker Chinese-language web novels suggests that a Chinese audience is also receptive to longer works. It appears that there is a universal preference for short novels, short chapters, and tight stories. In other word: pulp stories. There are themes, aesthetics and archetypes that transcend geographical, cultural and linguistic borders. Stories of high action and adventure, cool magic and advanced technology, compelling characters and intense drama will always gain traction no matter which language they are presented in. Tight, trim novels are appreciated no matter where you go. Stories that stand the test of time will always have willing readers. If SteemPulp is to take off, they must write their stories to fit market preferances. If PulpRev, Superversive, Noblebright and other affiliated movements are to make fiction great again, they must tap into the power of the universals. And fanservice is, most assuredly, not among them. My Dragon-nominated novel No Gods, Only Daimons is assuredly light on fanservice and heavy on action, tradecraft, and character drama. Check it out here. I didn't know this was you! I just read your name at the bottom. Now I realize why you have such interesting articles.